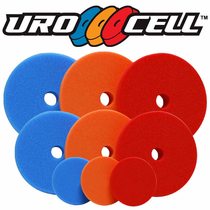 Buff and Shine Uro-Cell� Foam Grip Pads� are made of a highly advanced European foam that was specifically designed for automotive paints. The foam pad design was driven by automotive manufacturers who demand extremely durable pads that can efficiently handle the rigorous environment of dozens of buffing technicians working non-stop to perfect the fresh paint of hundreds of newly manufactured vehicles coming off the assembly line on a daily basis. The Buff and Shine Uro-Cell Foam Grip Pads may be used with rotary buffers, random orbital DA polishers as well as gear driven dual action polishers to produce fantastic results in less time.